If it is Night, reduce the cost to play The Night by 3. If it is Night, treat all exhausted non-unique characters as if their printed text boxes were blank. Flavor Text: It closed in, and cloaked him in darkness. That ability can definitely backfire, but if your deck doesn't suffer too badly from it you have a way to deal with Claret Knight, among other things! Cost 3 for skill 6 is great too. Well, The Claret Knight is unique. The 'other things' part is right, however. Damn that Claret Knight, spoiling my plans once more! 4 Terror icons is pretty heavy overkill, but if you can play this for 3 you're getting some good value off the 6 skill. It's still pretty fragile though--no Toughness or Invulnerability, and no combat icons. The text blanking effect can be useful, but most things you want to blank will end up being unique anyway, so don't rely on it too much. Just like arkham asylum and the enchanted wood this is another great yellow card in disguise. This is an anti willpower card and nerfs several MU cards that mess with terror struggles, for those reasons alone it's great for hastur. It also prevents a lot of subtype synergy, like stopping deep ones from gaining terror icons. Being able to play him cheap is a bonus and he combos well with under the yellow sign where his 4 terror icons count against every struggle type. The downside is he prevents your non-unique lunatics from triggering every turn, unless you are using arkham asylum which will let you trigger them multiple times each turn. Don't play this card alongside Tenebrous Nightgaunt. As soon as the TN exhausts, the endless loop between the The Night and TN will create a black hole that will destroy reality as we know it! The looping is addressed by an erratum. 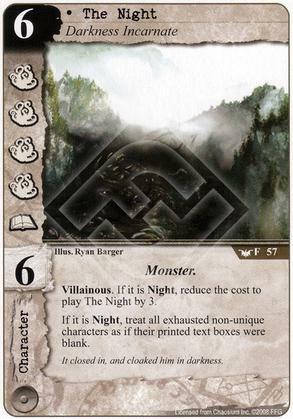 Night cards are exempt from the effect of The Night. See the first comment here on this card, quoting the FAQ. Applies to Shadowy Figure, Mad Maudlin, Tenebrous Nightgaunt, Shuggob, etc. Ah, right on. And here I'd thought I'd found an infinite loop. Darn you, errata!